In surveying the current socio-cultural landscape in America, it seems increasing numbers of individuals are either identifying as social justice activists or aspire to be one. What began with the protestations of one individual over perceived systemic “racial” injustices being perpetrated against black people, primarily by those who occupy certain positions of authority (e.g. police officers), has morphed into a global movement with other notable athletes and celebrities remonstrating in solidarity. And though science continues to provide the world with objective evidence to support his conclusions, it is not necessarily my intent that this blog post serve as an apologetic for Sussman’s, or anyone else’s, epistemology of race. That said, I find it interesting, if not ironic, that many who do subscribe to the concept of race as a scientific reality, choose to engage in discourse about those who exhibit “racist” attitudes, either overtly or covertly, not from the standpoint of biology but morality. Firstly, how can something whose ontological premise (race) is based solely on skin color become a matter of morality (racism)? After all, if such an attitude (racism) is simply a biological response to what is merely a product of biology (race), should not the remedy for such an attitude also be biological as opposed to moral? Secondly, and, conversely, if, in fact, racism is merely a biological response to a biologically-produced attribute of humankind, then, why is racism ever “wrong” to begin with? In other words, at what point does morality begin to supersede science? And, lastly, by whose or what standard of morality would it be determined that racism is “wrong” and by whom? Notice in the aforementioned text that Abel is twice referred to as the “brother” of Cain. This is important to note because when it comes to matters of race, and race relations, the ethnocentric ethos to which many people subscribe today is predicated on our horizontal relationship to one another as opposed to our vertical relationship to God. In other words, the assertion that racism is “wrong” is based primarily on the egalitarian proposition that we are created in the image of each other (imago homo) rather than in the image of God (imago Dei). This mindset is why countless social justice activists are demanding a so-called “end” to racism because they believe sincerely, albeit naively, that the genesis of racism is biological (melanin) not spiritual (mindset) and, as such, that human beings inherently possess the capacity to “stop” being racist. Which, again, begs the question: how is it that such a stabile, invariable, and constant characteristic as skin color can so affect the human heart as to result in the egregious maltreatment of others who don’t look like us? The God of all the universe, in His infinite and unfathomable wisdom, created and fashioned you and me with the specific ethnic qualities we each possess. Yes, racism is wrong, but it isn’t wrong for the reasons you think. It isn’t because we all bleed red that racism is wrong. It isn’t because we all belong to a collective “brotherhood of man” that racism is wrong. It isn’t because we all breathe the same air that racism is wrong. It isn’t because of our sociological, anthropological, or biological similarities that racism is wrong. Racism – a word I personally loathe but will use for the sake of this commentary – is “wrong” not because you or I declare it to be, but because it reflects a sinful heart-attitude that disavows the glory of God by deliberately harboring hateful biases toward those who, like you and I, have been created by God to reflect His image to a sin-sick world that does not know Him as Savior and Lord (Gen. 1:27; Matt. 5:13-16). It is the objective, never-changing truth of the gospel that makes racism wrong, not the subjective, malleable ethics of mankind. So, to those who are calling for an “end” to racism, I applaud you, and I have the utmost respect for you. Nevertheless, I often wonder, do you truly understand what you’re saying when you say that? Do you have any idea what you’re really asking (Matt. 7:2)? What you are actually demanding, whether you realize it or not, is complete attitudinal and behavioral perfection from every sinner who resides on this planet (yourself included.) Now, consider, please, my brother and sister, how do you propose to achieve this level of collective holiness? Through more protests? More laws? More social media hashtags? More race-based or socio-economic class-based government programs that will help “level the playing field”? You know, don’t you, that none of those is really the solution to the concerns you have? Of course, you do. And the reason you know it is because you understand fully that the real problem is not the darkness of a person’s skin, but the darkness of their heart (Mk. 7:17-23). Great perspective. Thank you brother. Oh my goodness! I love the way you word things! This is so true, so clear, so perfect for these times! I have asked myself, so often, why? 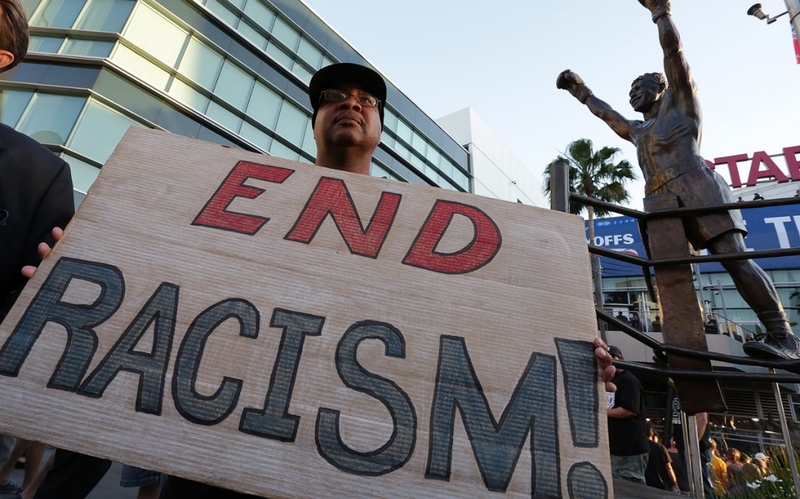 Why is racism so prevelant today? Why is it all we hear about in the news? The answer is that so many are rejecting God in every aspect of society and on every continent! Unless we frame our lives with Gods word and with the heart and head knowledge that we are His creation (everything is His creation), we will never respect or love each other. Oh! Come children and drink The Living Water!!! I loved your understanding on this subject, of which is becoming more prevalent. Even though it has always been a persistent problem around the world, you have shed light onto something that has had light shed on it before, to the extent that people have become blind to. Wish we could, that would take on the sin problem as well. Not gonna happen. Thank you Brother Darrell, for sharing what God has given you, that others might have their eyes opened; even a little bit opened! AMEN! THIS my Brother, is the TRUTH, whole TRUTH, and nothing but the TRUTH! This encouraged me as a Believer that there is STILL a remnant in Christ that can discern straight up Sin from social issues and speak out BOLDLY against it! Keep holding up the banner of Christ and SOUND BIBLICAL teaching! Brother Darrell, You are going to be hated by some who have read the title of this essay, and nothing more. You are going to be hated by some who have read and yet do not quite get the points you make. And you are going to be hated by some who read, and understand, and yet still burn because you undercut some of what they are basing their lives and beliefs on. So please allow me to say I agree completely with you, and they can hate me too. I’m also going to say, while I sincerely believe it is wrong to judge or hate someone because of their appearance and so forth, I judge young men who wear their caps backwards and their jeans too low; I judge men my age who have beards to their chests and long hair; I judge women who look as if they are maxing out their credit cards to look like they/their husbands are millionaires; I judge young women who wear those “fashionable” torn jeans. Can’t seem to help it. I’m human, we all are. But greater is He who is in me than he who is in the world, and I can do all things who Christ who strengthens me. Praise God! Therefore, lost hold of the real hope – the Gospel of Jesus Christ! I wish everybody could read this. I wish everybody would read this!! There are two Biblical reasons why racism is wrong. You got the first reason. The other reason is because racism is a denial of the Total Depravity of mankind. As Paul writes, “For I have already charged that all, both Jew and Greek, are under sin.” Racism is wrong on this front because the racist must assume that he is somehow less depraved than his fellow sinner, and, conversely, that the other sinner from a different race is more depraved than is the racist. How arrogant. Total Depravity is the great equalizer for every single person in mankind’s fallen state. Having been on the Left, I can testify first-hand to the hollow and unsatisfying nature of Marxist oppression theories. Ever since returning to faith and rereading the Jewish Bible, I found a far more satisfying groundwork upon which to base my belief in justice. And that starts with the idea of a just God. Very interesting post. I agree that at its core, “racism” is sin of which we must repent, for we all are created in the image of God. Listening now to a podcast you are guest on Mortification of Sin, Social Justice Black Hole, which is how I learned of your blog. I am a white Christian woman really trying to understand more about this whole topic of systemic injustice, ethnic reconciliation and redemption, and I would love to talk with you sometime about this! Thank you for sharing your thoughts and experiences.